SmaSpike K1 is combined with one aluminum pole and one spike foot. Metal spike foot can be well concealed inside the aluminum pole when not in use. Spike Foot is designed with a four-fin cross pattern that keeps the spike planted firmly into the grass, sand, dirt or snow for filming. SmaSpike K1 is made of lightweight aluminium alloy enables you carry around to capture those perfect shots outdoor. SmaSpike K1 reach 16″ when fully extended. It can be connected with other 1/4″-20 threaded hole poles, like SmaPole Q1, SmaPole S3, etc. SmaSpike K1 is combined with one aluminum pole and one spike foot. Spike Foot can help stabilize the pole into grass, sand, dirt or snow. It enables you to capture those perfect shots outdoor. Aluminum pole reveal the metal spike foot for rugged outdoor terrain, but hide it to keep indoor flooring safe. SmaSpike K1 is made of lightweight aluminium alloy that you can carry anywhere and won’t be damaged. 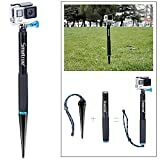 Uses a 1/4″-20 threaded screw to attach Other Poles or tripod mount for GoPro Cameras. This entry was posted in Discount Photography and tagged 1116, 5/4/3+/3/2/1/Session, Aluminum, Foot, GoPro, Hero, Pole, SmaSpike, Smatree, Spike by Ball Photo. Bookmark the permalink.